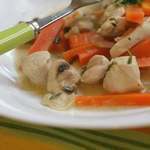 Here you will find a lot of easy French chicken recipes. Everyone will enjoy your gourmet cooking skills and only you need to know how easy it is! The complaint that a lot of people had that night is that chicken had no taste anymore. Because of the increasingly industrialized methods used to produce poultry, the resulting meat was becoming more and more bland. Classe A. Your everyday chicken raised in cramped quarters and fed industrial flour (whatever that is and I'm not sure you want to know). Red Label. A Label Rouge is the next step up. It is at least 12 weeks old. Farmer's Red Label. (Label Rouge Fermier) Here's a bird that has had a bit of care. Raised on grain and in the open air, its flesh will be white or yellow depending on whether it ate wheat or corn. Ground almonds are frequently used in French recipes and here they make a coating to keep chicken breasts moist. Crunchy sliced almonds and a honey vinaigrette complete the dish for a great flavor combination. Breading is a fairly easy technique to master especially if you do not mind getting your fingers a little messy. Kids and teens gobble up these paprika spiked fried strips. One of the classic French chicken recipes may not be French at all. Does not matter - it is still delicious and not too hard on the calories when it is baked (ergh . . . that is before the shallot cream sauce). Another recipe with controversial origins but yummy taste. 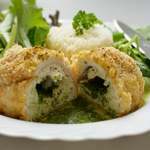 Chicken breasts are wrapped around herbed butter and deep fried for a dish that will impress your guests. Here is something you will find home cooks falling back a lot on in France. They do not like it too spicy, but you might. This is a very flexible recipe that you can use with any number of different ingredients. Decidedly different than the Chinese version orange chicken, here chicken, mushrooms and fennel are cooked in a little fresh orange juice. This French chicken recipe features lots of sunny colored bell peppers. Feel free to spice it up with a little hot sauce and serve it over rice. The chicken gets cooked and the sauce gets made all at the same time. 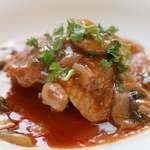 One of our classic French chicken recipes, this features mushrooms, shallots, and cognac. Serve with rice and a baguette - you'll want to enjoy every drop of the yummy sauce. With only a few ingredients, this mustardy chicken cooks up quickly in a skillet. Don't be afraid to cook with mustard, its flavor completely mellows with cooking. 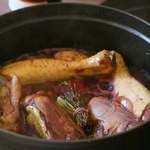 A fricassee recipe in France typically calls for browning the main ingredients in butter and then sprinkling the dish with flour before adding a liquid. The resulting sauce in this recipe is richly divine, but very easy to make. A French chicken recipe that commemorates Napoleon's victory on the battlefield in Italy. Made with tomatos, mushrooms, onions and white wine. Once upon a time this would have been a glorious Sunday afternoon dish, but in our affluent times eating a tasty bird has become commonplace. This is chicken cooked in wine and it is as delicious as it is easy. This is a all in one meal and meant for hearty appetites. It is testament to the Moroccan influences you will find in French home cooking, and features harissa, ras el hanout and merguez sausages. Throw the ingredients for this quick easy chicken recipe in the crockpot in the morning and come home to a warm meal. Tart but not too tart. Wait until you can find some fresh tarragon before trying this yummy and every so easy dish. Tarragon combines with cream, lemon, and pepper to give chicken a wonderful bright, fresh taste. If you are looking for a new way to cook a tasty chicken dinner tonight, try vinegar. You'll be amazed at the delicious tenderizing effect it has on chicken. This is for when you are going to stuff your chicken (or any other bird as well). You can also make it as a side dish and it could be served along a pork roast to very nice effect. Kate puts the emphasis on quickly prepared dishes without sacraficing on flavor, including this divine sounding apricot chicken recipe.